There are no bike trails on Captiva, but cyclists are free to use the roads. If you follow the main road, it will take you from one end of Captiva to the other. There's beach access at both ends of the island. The distance is 4.8 miles, from Blind Pass at the southern end of the island to the public parking lot at the northern end. Beaches can be found at either end. Captiva sand seems a bit less powdery that Sanibel sand. Pets are not allowed on Captiva beaches. A favorite spot for watching sunsets, Turner Beach is located at the southwestern tip of Captiva, just after crossing Blind Pass from Sanibel Island. There are restrooms, showers, water, and public parking. Follow this link to find the current parking rates. Blind Pass no longer separates the two islands; the beach actually continues uninterrupted from the southern end of Captiva to Sanibel. 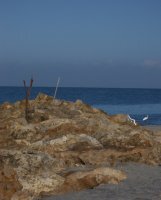 From Sanibel, follow Sanibel-Captiva Road to its western end, and cross the bridge. The bike path will end about 1/10 mile before the bridge, just continue on the road and across the bridge. 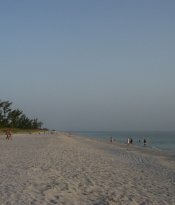 Coming from Captiva, follow Captiva Drive to the south, and the beach is just before the bridge. Cars: there are only a few parking spots here, and the cost is $2 per hour. Restroom facilities are provided by portable toilets (i.e. port-a-potties). Follow Captiva Drive to the parking lot at the northern end. The road beyond the parking lot is private. Slightly south of there, you'll also find nice beach access at the western end of Andy Rosse Lane, but no public car parking. It makes for a nice place to take a walk after dinner at the Mucky Duck.